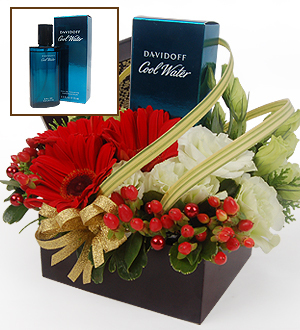 Davidoff Coolwater EDT 75ml for men Cool, fresh and invigorating. Coolwater is fresh and crisp with notes of lavender, menthe, iris and musk. A multi-dimensional fragrance that evokes a sensation of sea breeze and the northern air. This contemporary fragrance comes beautifully packed with Gerberas and Eustomas. For outstation deliveries, kindly provide at least 3 days notice. Fresh flowers will be replaced with artificial flowers or other item for outstation deliveries. Call our Customer Service at 03-78830233 / whatapps 012-6915200 or email sales@gift-lab.com for more details.